What a delightful way to say "Thank You" - send a hand-stamped card that will delight! 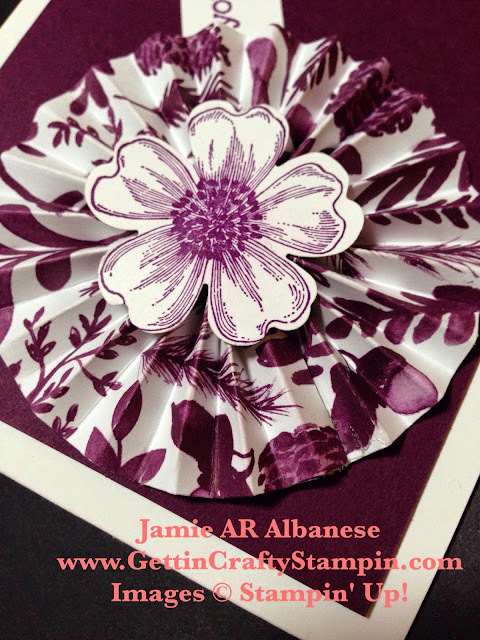 This card, from our Fall for Fall card class, was a HIT! I adore the colors and simple greeting. When someone blesses YOU, send them a note to say it! In a world where we receive more bills and solicitations, receiving a note of encouragement is a sure fire way to bless and be remembered. Join me in creating this pretty card (and see how to get Designer Series Paper for FREE). Create this stunning Rosette/Lolly using our Simply Scored Scoring Tool. 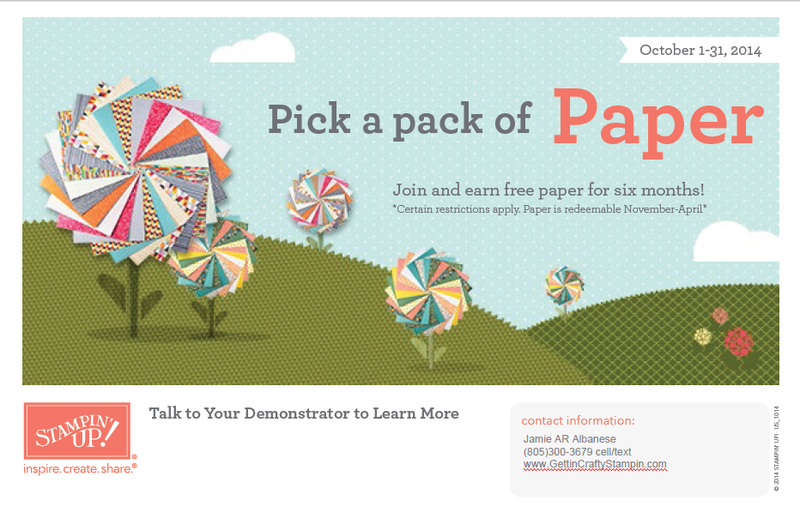 I LOVE, Love, love the Color Me Autumn Designer Series Paper!! This collection of prints and colors are stunning! Using the Simply Scored Scoring Tool lay your sheet of 12"x12" Designer Series Paper on it. Score all of the 12" page if you want to use multiple strips! Score at every 1/4" mark and cut a strip at 1-1/2". Fold and create a Lolly/Rosette using Hot Glue to hold it on the Blackberry Bliss (that is cut down to 5"x3-3/4"). Stamp this sweet pansy from the Flower Shop rubber stamp set in Blackberry Bliss ink on the Whisper White card stock. The Pansy Punch is designed to coordinate with this stamp set and makes it easy to pop out the stamped image! Using Hot Glue to adhere it to the Lolly/Rosette center. 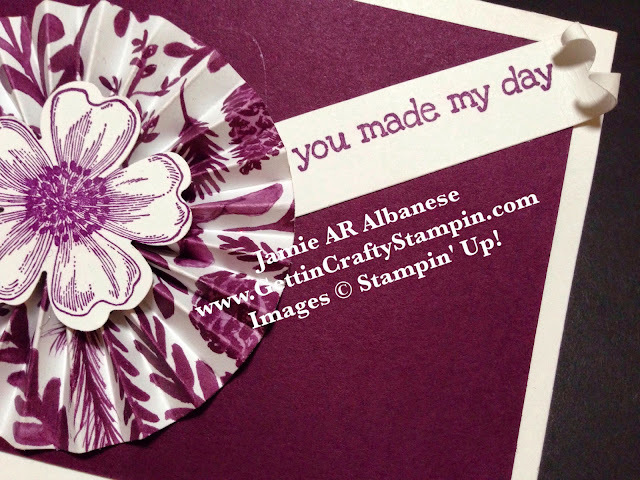 Stamping this 'you made my day' cheer from the A Dozen Thoughts rubber stamp set in Blackberry Bliss ink on a strip of Whisper White card stock. Using my Paper Snips to create this flag end. Use the Bone Folder to roll the edges for some fun to this card. What a fun and easy, rich in color and style, hand-stamped card (it was a HIT at the Fall for Fall card class - don't miss out on the many crafting class options and Join the Fun!!). The world is a tough place, send some cheer in a hand-stamped card. This rich colored card is sure to delight all who receive it and see it (you know it'll be displayed). Tell someone how special they are and see the smiles grow - paying cheer forward is a great way to make the world a better place! 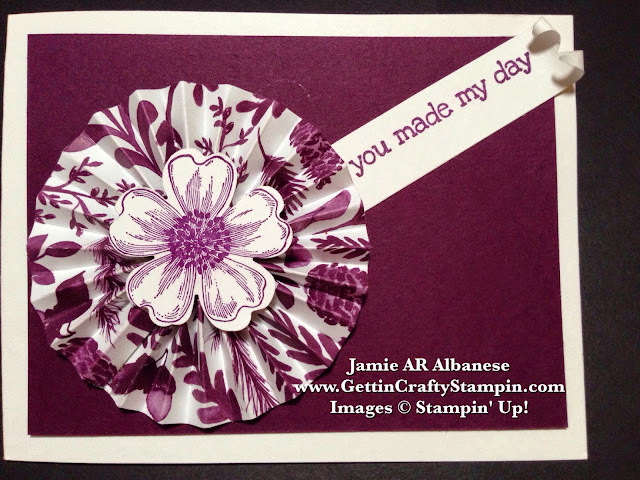 This hand-crafted card with it's Free Designer Series Paper is a sure fire way to deliver smiles!